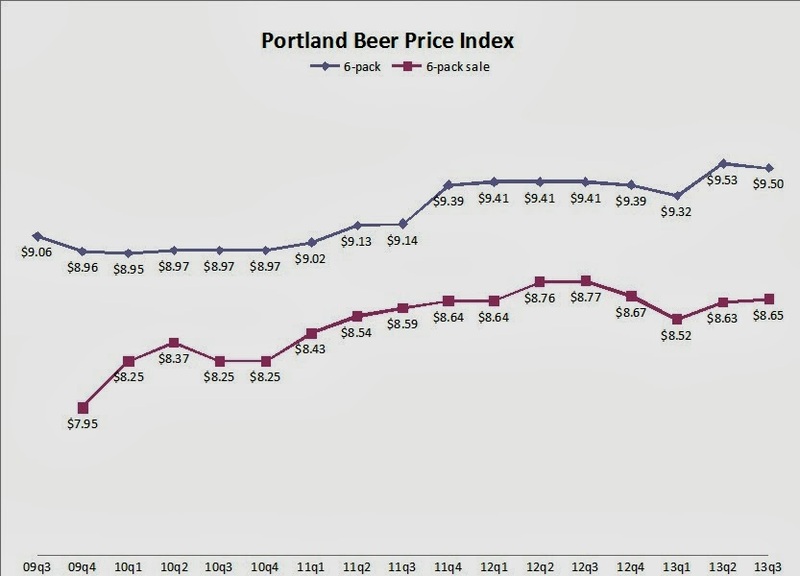 Kind of a quiet installment of the Portland Beer Price Index (PBPI). Prices are all within a nickel of last quarter's prices (after adjusting for a change I made to the stores in the index). Sale prices were slightly less generous than in the summer, though the shelf-tag price on six-packs went down slightly. An insider that frequents these posts hints that we are going to see a serious price rise next quarter -- I'm not looking forward to that, but it won't be a big surprise. You can see from the graph that there was a big jump in Q4 of 2011 that sort of set the level for our current prices. I made a switch this quarter, and subbed in the Hawthorne Safeway for the Division New Seasons. Not finding HUB IPA bombers at New Seasons was the final straw for me. A few years ago their beer selection seemed amazing for a grocery store, but nowadays it is a little sparse. Still a good selection, for sure, but other stores have expanded their beer space, whereas New Seasons has shrunk theirs a little by trying to add in a bunch of ciders. The switch was pretty smooth, since I actually gathered the Safeway prices last quarter, so I was able to make an apples-to-apples comparison against the same bucket of data. If you try to compare the actual numbers reported last time, it looks like the non-sale prices are way up this time, but the sale prices aren't so different. That may be because New Seasons touts an "Everyday Low Price" on a lot of common beers, instead of pulling the usual grocery store stunt of showing an inflated shelf price that is marked down every day of the year. If you require more information on the makeup of the PBPI, read the page which describes the composition of the index. Check back around Christmas to see the final numbers of 2013. The beer here, if you'll pardon the expression, is already too expensive. I don't think we need another round of price hikes. At discount stores in Minneapolis, the tax-included six pack equivalent for Widmer (and other large regional/national craft) is $6.06 when you buy a dozen. Every day. Try to find that as a sale price just up the street from the brewery at the Plaid Pantry in Overlook, or Freddy's in Arbor Lodge, never mind the 60 cent deposit I surrender to the convenience of curbside recycling. What accounts for the disparity? The product is the same. Shipping is obviously much less expensive. If it comes down to taxes, I'd like to see the numbers. Say what you like about Oregon's tax climate, but Minnesota isn't so moderate. I'm dying to know what they're asking for Sculpin. Hey Champs, are you following this thread on email? 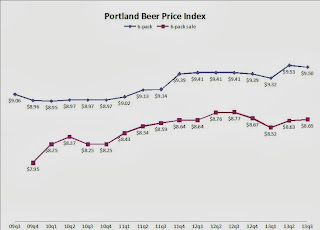 I want to write up a rant about Oregon beer prices, would you mind letting me pick your brain over email? Drop me a line at the "Email me" address on the blog. Thanks! Just out of curiosity, does the Division New Seasons carry HUB IPA in cans? I wonder if it makes sense to continue using HUB IPA bombers for the index when that same beer is available at a significantly lower price per ounce in a different package. They do have the HUB cans. The thing is, I set this thing up before the tall-boy craze hit, and the two numbers I gather compare like-volumed packages (six-packs and bombers). Because of the bizarre way beer is priced, it doesn't make sense to glob them all into a single six-pack equivalent price, because bombers are about 80% more expensive than six-packs, and tall-boys are what, 33-50% more expensive? Oregon has one of the lowest beer taxes in the country. According to the site below we are ranked #45. Beer is more here mostly because brewers and distributors think they can get it. Retail margins in Oregon are similar to most of the country. Most brewers and distributors have announced a price increase effective October first. Most craft 6 packs are going up about $1.00 per case. Bombers are more of a mixed bag, but typically the bombers targeted to sell for around $3.99 went up about $2.50 per case. There were some exceptions, especially among the bombers with current retails over $3.99. I don't get bomber pricing, and I lobbied hard to get bomber per ounce pricing more in line with multipack pricing. I had no luck at all is as evident by that fact the gap is widening with this increase.